After we die, our rotting bodies release specific types of gases into the environment. When a body goes missing, dogs can sniff for these gases to track it down. But forensic scientists are still trying to nail down the exact “smell of death” that is unique to humans. Now, a team in Belgium has identified seven compounds that only pigs and people produce late into decomposition. When a body first begins to decompose, enzymes dissolve the cells from within. Next comes bloating and putrefaction, giving the corpse a greenish tinge. Active decay starts when the skin breaks and the corpse begins to liquefy. Soon, only shreds of flesh cling to the body. By the end, only hair and bones are left. Figuring out which chemicals our bodies release at these different stages would allow cadaver dogs to be trained to find bodies at specific points in their decay. In the new study, scientists examined a menagerie of remains from six humans and 26 animals that included pigs and other other animals that included pigs and other mammals, fish, frogs, turtles, and various birds. The team sampled the gases surrounding the remains at 9 and 12 months of decomposition. 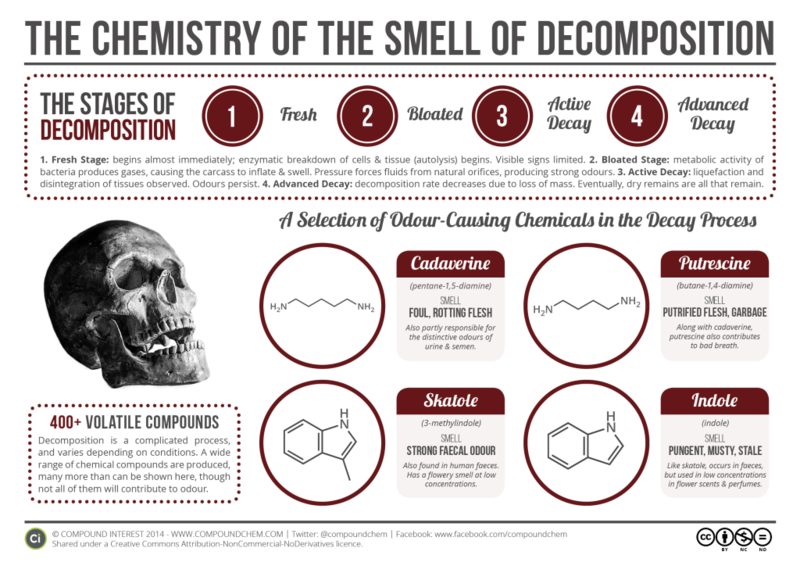 Previously, the scientists had investigated the corpses at 6 months of decomposition, and came up with 8 compounds only released by human and pig bodies. The new work confirmed that 7 of them are still hanging around later in decomposition. “This means that these 7 human and pig specific markers can be used in the development of training aids for cadaver dogs during the whole decomposition process,” wrote the authors who published their findings in Forensic Science International. The other compound, diethyl disulfide, could be used to detect bodies at the beginning of decomposition. When the team sampled bodies after 6 months, the bodies had already passed into advanced decay. After 12 months, the corpses had not yet dried out, so it’s not yet certain whether the bodies still release these compounds very late in decomposition. The remains also stayed tucked in glass jars, so scientists will have to investigate whether changes in moisture or temperature that occur out in the open influence which chemicals are released. Currently, cadaver dogs are trained on the stench of compounds such as cadaverine and putrescine. But dogs sometimes fail to pick up on real body parts, indicating that these training scents do not capture the full complexity of the real decomposition odor.